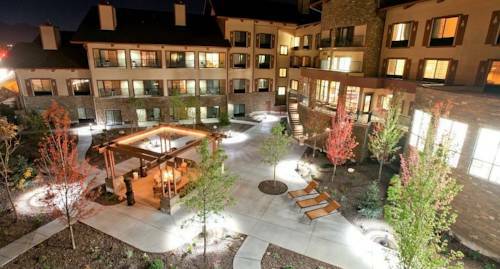 Indulge in the thoughtful amenities and comfortable accommodations at Courtyard Flagstaff. Located at the crossroads of I-17 and I-40, our hotel is moments from Arizona Snowbowl and within walking distance to Northern Arizona University, ideal for business and leisure travelers alike. Each of our well-appointed rooms offer spectacular views of the San Francisco Peaks while select rooms boast private balconies overlooking our serene courtyard. Stay connected and video conference with loved ones using our complimentary high-speed Wi-Fi. At our on-site restaurant, The Bistro, you'll find a delicious variety of American favorites along with handcrafted cocktails and beverages made with Starbucks coffee. Maintain your active lifestyle at our fitness center and unwind in the heated indoor pool and whirlpool. If business is the reason you're in town, host a collaborative conference in our modern event spaces offering catering options and AV equipment.